In collaboration with Donna Moore, John Allen and Anna Lawrence, The Big Camera is a modified cargo trailer that functions as an extra large format camera, a Camera Obscura, and a portable classroom and community outreach vehicle for a A1labarts, a cooperative art space in Knoxville, Tennessee. We were honored to receive The Ann and Steve Bailey Empowerment Grant in 2017 from the Arts and Heritage Fund to cover part of the cost of The Big Camera. We have taken The Big Camera to local schools, art centers, parks and festivals, demonstrating and teaching historic processes. The Big Camera is a connection to historical ways of working in photography, often requiring on site processing in horse drawn wagons or tents. There is no better way to understand a subject than by becoming fully immersed in it, and in this case that means, literally entering a life-sized camera! Seeing the world upside down and backwards is always a “wow” moment. Camera Obscura is Latin for “dark room”. The earliest historic record of its use dates to the 4th Century. It is a natural optical phenomenon that happens when a small hole is made in a darkened space and light travels through it to the opposite side creating an image that is upside down and reversed. Our eyes and cameras work the same way. A lens in modern cameras and in our eyes ‘corrects’ the image. The Big Camera has a simple lens that magnifies the light that comes inside. This allows the viewers' eyes to adjust much faster while looking inside the darkened trailer. When the trailer is used as a camera this also shortens the exposure time to 15 – 20 seconds depending on the light conditions. We also use it as a pinhole camera but the exposure times can be an hour or more, good for landscapes but not for portraits. The focal length is 68 inches, which means the pinhole diameter is 2mm with an f-stop of 8964. 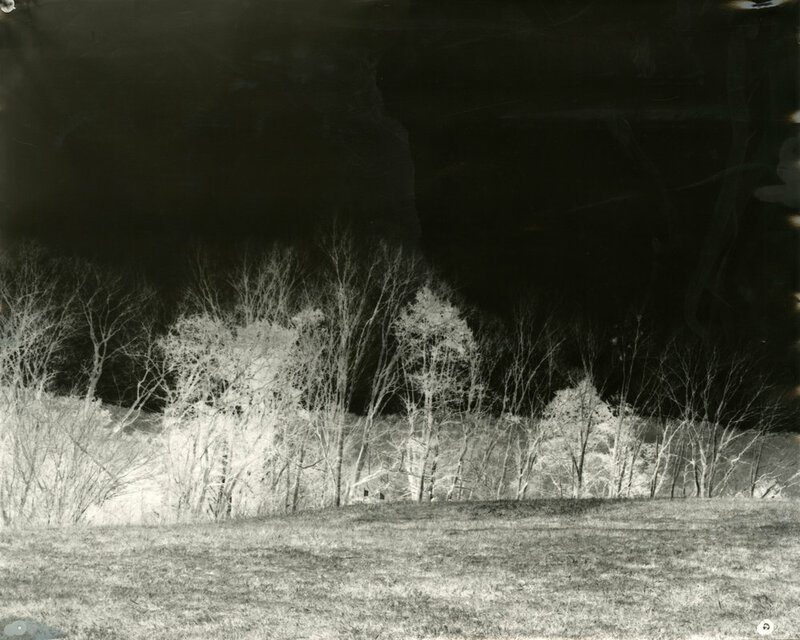 This is the negative of a pinhole landscape photograph. It was a forty-five minute exposure on a partly sunny day. To make a portrait takes a bit more hands-on time. Black and white photographic paper is pinned to the wall inside the camera. The image is then focused, sometimes this means moving the subject and their chair outside the trailer. Black tape used as a shutter is removed and the time is counted. The shutter is closed and the paper is developed in the trailer using a cellophane rubylith filter for the red light. It really feels like the old days – we have no electricity or running water. The negative was scanned, inverted and flipped horizontally to create a positive image. 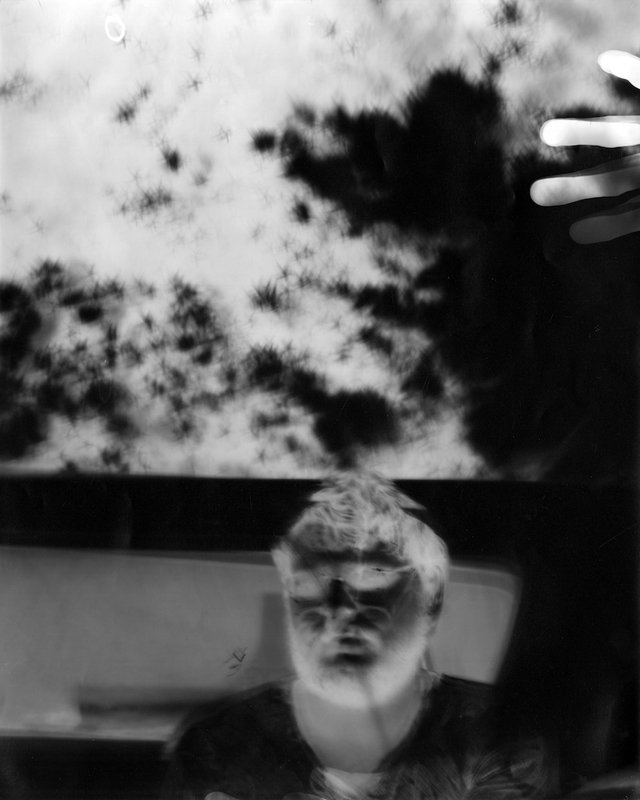 Our workshops focus on Lumen Printing, Cyanotype, and Pinhole Photography. With these three processes it is easy to teach the history of photography in a visual way. 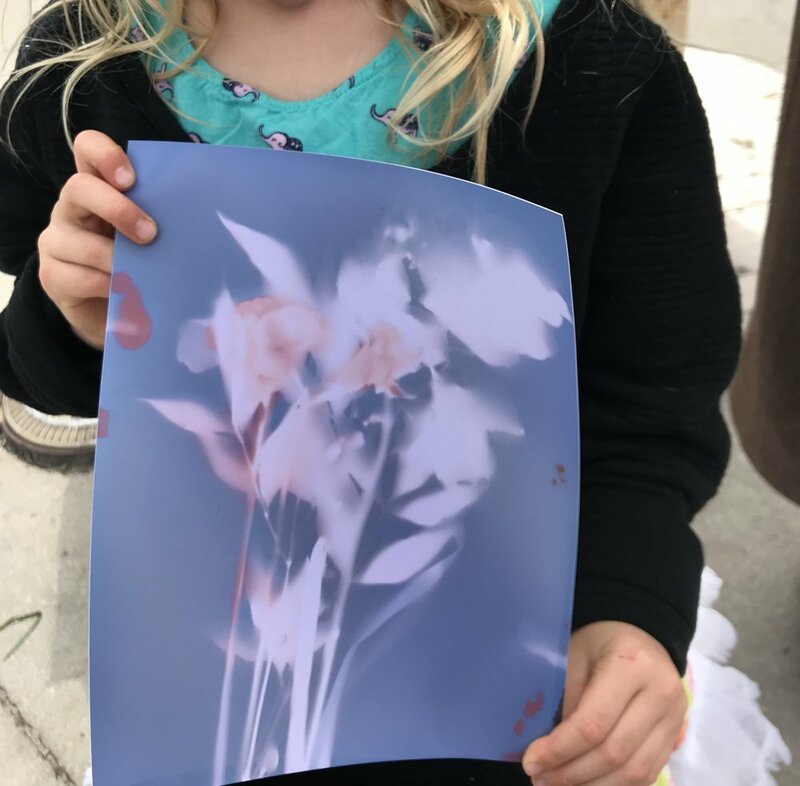 A Lumen print is made using photo paper and the sun to make an image. They are similar to Sir William Henry Fox Talbot’s photogenic drawings that were the first photographic process able to produce negative images on paper. He put botanical specimens on sensitized paper and exposed them to the sun. We use black and white photographic paper and plants and the sun to create colorful images. Cyanotype is also another important development in the history of photography. It was one of the first contact printing processes developed by Sir John Herschel in 1842. He did not use it for photography but for reproducing notes. It was Anna Atkins, a family friend, who used it to create an album of algae specimens. A combination of two light sensitive iron salt solutions and the sun are used to create brilliant blue prints. Anna Adkins is considered to be the first female photographer. We celebrate her birthday with cake and cyanotype making! It’s a very simple process. Plant materials or negatives are place on treated fabric or paper. It is left in the sun to develop and then simply rinsed with water. Pinhole photography is one of the simplest forms of photography. 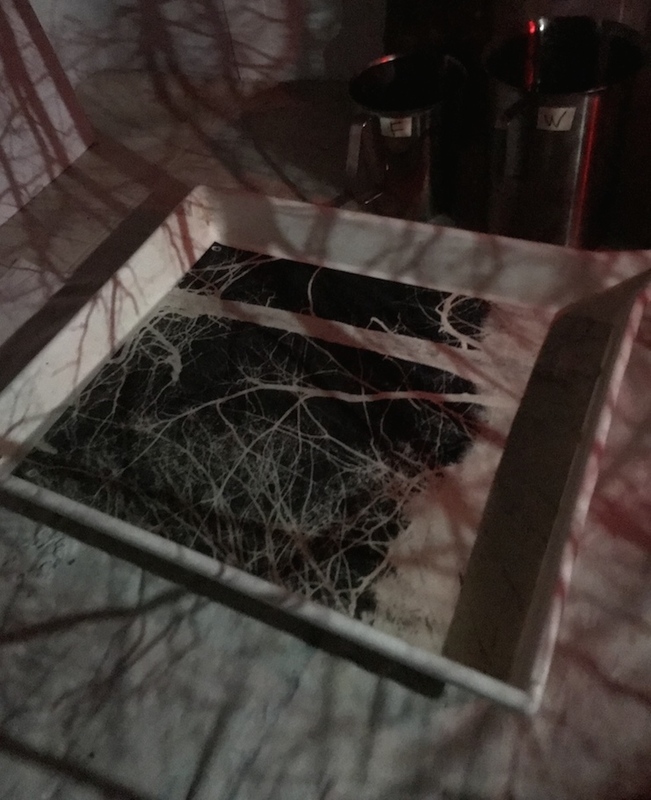 A light tight container with a small pinhole allows light to enter and form an image on the light sensitive paper inside. In our workshops we make cameras out of all sorts of things - paint cans, cookie tins to cardboard tubes. Every camera has its own view with infinite depth of view and distorted perspectives. Slower exposure times produce creative images. Magic happens with pinhole photography. This pinhole image of the trailer was taken with an Illy coffee can camera and was the first image to be developed in the darkroom trailer. Worldwide Pinhole Photography has been celebrated on the last Sunday in the Month of April since 2001. Everyone is encouraged to make or use a pinhole camera to take a photograph and upload it the official site with others from around the world. We will be celebrating Worldwide Pinhole Photography Day at the Central Filling Station in Knoxville, Tennessee. It is a food truck park. Our Big Camera offers art food! We will share our homemade pinhole cameras and invite the community to take photos for this special day. Our camera crew will develop the paper negatives in the trailer darkroom and the images can be scanned and uploaded to the official website. All this fun stuff is based in Knoxville, Tennessee. Follow The Big Camera on Instagram and Facebook, and keep up with A1labarts on Instagram and Facebook too!